A large number of sneakerheads feel nostalgic with the classic design of the Adidas Marquee Boost. They say the design reminds them of the Adidas Streetball. The majority of Adidas sneaker fans can’t help but compare the Marquee Boost to the Pro Bounce 2018 and the Harden Volume 3. They claim all three perform equally great. Wide-footers are happy that these Adidas basketball sneakers fit them nicely. Several users mention that the Adidas Marquee Boost is light. The herringbone traction pattern grips both indoor and outdoor courts well according to many reviewers. Most purchasers say that the mesh upper of the Adidas Marquee Boost holds its own really well and remains intact even after many uses. A good number of buyers notice that these Adidas shoes provide very good ankle support. The mesh upper of the Adidas Marquee Boost delivers a flexible and breathable fit. These Adidas basketball shoes deliver top-notch comfort. The ankle comes with foam pads that feel like memory foam. The Adidas Marquee Boost lacks torsional rigidity, mention a few. A handful of wearers observe that the shoe is not breathable enough. The translucent outsole rubber of the Adidas Marquee Boost is not durable enough for outdoor use according to many testers. Some buyers say that these Adidas basketball sneakers have a hideous design. A couple of players wish that the sole at the forefoot is raised up. The flatness makes it hard for them to run when playing basketball. The Adidas Marquee Boost surprised the sneakerhead community when it was released. It looks like a retroed 90s Adidas basketball sneaker. However, when it was brought to court, it performs just as great as the famous signature basketball shoes. It has great traction, a cozy upper, and a responsive midsole. It is so close to what a dream basketball shoes is. Though minor hiccups are mentioned by a handful of wearers, the Adidas Marquee Boost will surely be one of the top basketball shoes for 2018. For $140, it is a little pricey in my opinion especially due to the materials that they used on the shoe. But in terms of performance-wise, I would say that these are great performers. They do the job, you, know, in every single aspect. If you, guys, are curious, I definitely recommend picking up a pair especially if money isn't an issue to you. They're great performers on-court like I enjoyed it. I just wish that this was a low because I really didn't like that restrictive feeling around my ankle. Adidas is tightline for the Marquee Boost is the most comfortable shoe in the game. The cushion and the materials both together and did a madness when it comes to comfort. And everything else follow too. For it to get 8.4, non-signature, right after the Pro-Bounce, yeah. If the Beard was the Beard balling in the 80s this would be his sig shoe. The Marquee Boost plays almost exactly the same as the Harden except it’s a high/mid with different styling. If you buy a BMW and swap out the exterior of the car, that car will still feel like a BMW since the actual guts of the car haven’t changed. The same thing applies here; the V3 was already a great shoe except for a little heel slip for me but with the Marquee, I get the almost the exact same cushioning, similar traction but with a whole new upper look that actually improved the fit for me. This is one of those shoes that I forget I’m wearing when I’m court but at the same time I get the look good feel good effect and at the same time I’m getting everything I could want out of a shoe. Designed with a classic look packed with updated technologies, the Adidas Marquee Boost is made for speedy players. It boasts the Boost cushioning for an ultimately comfortable ride and protection against impact. The outsole features the tried-and-true herringbone traction pattern for superb grip especially when the player is on his multidirectional footwork. 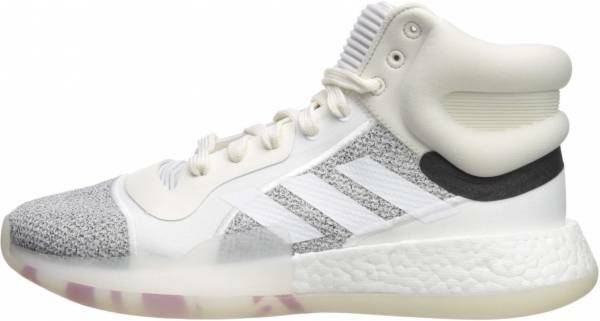 These Adidas basketball sneakers are released in December 2018 and retails at $130. Cushion. The Adidas Marquee Boost features a full-length Boost midsole. The thin forefoot foam delivers court feel while the thick heel foam absorbs impact. Traction. The outsole of the Adidas Marquee Boost features a zonal herringbone traction pattern. Depending on the colorway, the outsoles of these Adidas shoes come in either gum, solid, or translucent rubber. The translucent rubber is reported to attract a bit of dust, but it’s not something that minimal wiping cannot fix. Length and Width. The Adidas Marquee Boost reportedly runs true to size for wide-footers. Wearers with normal-sized feet are advised to go down half a size for a one-to-one fit. Lockdown. To secure the foot, the Adidas Marquee Boost uses the standard lacing system. This allows wearers to achieve a customized tightness and fit. The upper of the Adidas Marquee Boost is made of breathable mesh with textile lining for durability. The molded collar provides enhanced comfort around the ankle. The mid-top silhouette of the Adidas Marquee Boost has a classic vibe that is reminiscent of the Adidas Streetball series from the 90s. Aside from its awesome on-court performance, the Marquee Boost is voted by most wearers as a headturner in the streets. It is best paired with short pants and a loose tee. Washington Wizards point guard John Wall starts anew with the Three Stripes as the endorser of the Adidas Marquee Boost. A player exclusive is created for him, and it features a combination of shock red, collegiate navy, and cloud white. These Adidas basketball shoes features an abstract design in the ankle and outsole. To keep his trademark, the striped tongue features John Wall’s logo in black. Each shoe also has the “5 DEEP” callout on the lateral side. Made for the New York Knicks power forward Kristaps Porzingis, a special rendition of the Adidas Marquee Boost comes in a predominantly collegiate royal with core black, true orange, and white accents. The heel has the “The 7’3 uniform from Latvia” callout.